Lets start with PAP. Its three control frames are constructed as shown in Table 39. The Authenticate-Request uses one format, illustrated in Figure 37, while the other two frame types use a different format, shown in Figure 38. New value generated for each frame. Copied from the Identifier field of the Authenticate-Request frame for which this is a reply. 5 + Length of included Message. Contains a one-byte Msg-Length subfield that specifies the length of the Message subfield that follows it. The Message subfield contains an arbitrary string of data whose use is implementation dependent. 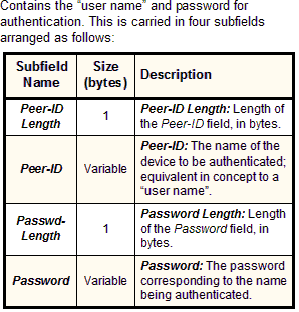 It may be used to provide an indication of authentication success or failure to the user. If not used, the Msg-Length field is still included, but its value is set to zero.